I went to the vet today. I look pretty good, and in lots of ways, I am just dandy. For one, I am processing a LOT of food lately. My appetite is good and everything looks good on the way out. The grass is short this time of year. The problem is that I am having trouble walking. The Farm Manager has arthritis and she says I walk the way she feels. Sometimes I even stumble, and the slick slimy deck is especially treacherous right now. A car ride? REALLY? Nuts. I’m not comfortable going up and down stairs, and so the Farm Manager hasn’t weighed me in a while. I’m looking a tad scrawny, though my fur is getting some winter bushiness. After seven and a half years of going to the vet, we have learned a thing or two. 1) You can’t put enough blankets into the car. and 2) You can’t take too many treats. We pack a bucket fulla food. Urp! Holy crap, is that snow out there? Ooh, I’m not feeling so good. I always seem to know what’s up. This time the Farm Manager wore a different scarf and hat so I didn’t want to put on my harness. Eventually I stepped into the harness and then we walked across the yard and OUT THROUGH THE GATE! I love this part. Up the ramp into the car is not quite as thrilling. I always get motion sickness, even as we are pulling out of the driveway! Winter corn-on-the-cob is so scrawny I can bite nearly all the way across. Oh yeah, my teeth grew back in just fine. It was a new vet clinic, but it was my friend Dr. Vincenzi! I sure was surprised to see him, but he was really happy to see me! Then things got serious. I’d rather not talk about the procedure, which involved a lot of stabbing attempts and then an actual bona-fide vampire stab. He thinks I am probably getting old and decrepit like the Farm Manager (it’s her birthday today!) so we are going to get me a sun for the kitchen. I’ll get pain medicine if my kidneys agree to it. When I’m showing off I bite the corn as close to the Farm Manager’s fingers as I can. She loves my silly games! More corn? That one was too small. I ate some corn and then stumbled out of there in my new slippy-slidey wobbly way of walking that scares the heck out of the Farm Manager. Then we went home, I had my bedtime milk and went to bed. That’s not a melted Fudgsicle. I got the last laugh today, though! Look what The Bartender found stuck to the side of my potato bowl! They thought I was a good boy today! Hah! HAPPY BIRTHDAY! We’re all getting old, Dobbers. Make sure you keep your teeth sharp, that’s all you need. Hi Dobby. I am sorry to hear you are having trouble walking. I can sympathize. After a summer with a hurting knee, I finally went to the people vet and found out I have arthritis! I used to give one of my elderly guinea pigs (who has since passed) glucosamine and omega 3 fatty acids and that helped her a lot. I think I need some too. 🙂 Keeping her warm also seemed to help. Hang in there! And tell the farm manger Happy Birthday for me. Sweet Dobbye! Mama takes wonderful care of you! 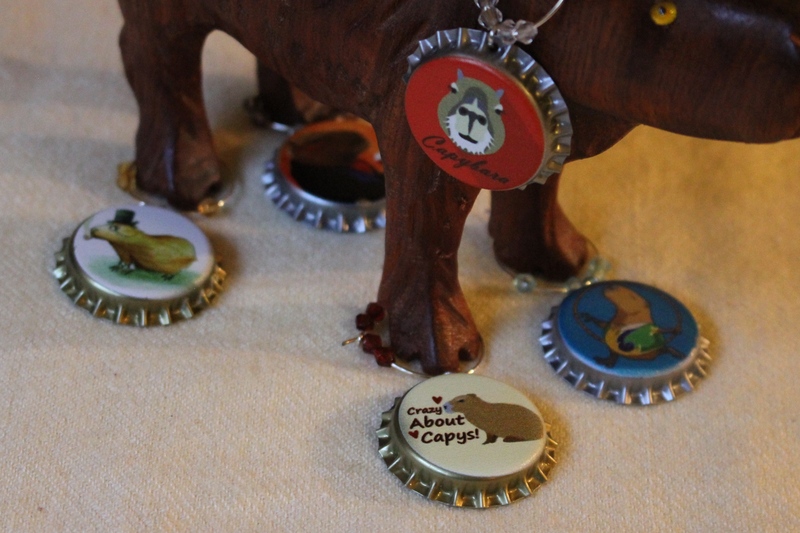 Chico capybara and I follow you and Muddy too! Chico capybara says “Getz wellz soon so you can chase doez ducks”!